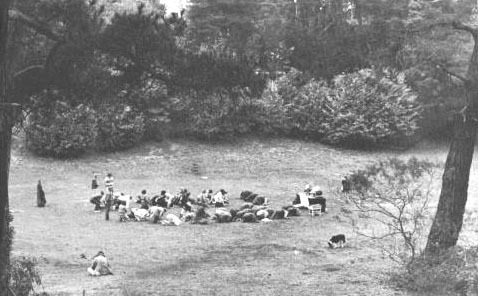 Anyone who was in Golden Gate Park on Saturday, February 19, 1977 for the Dharma Gathering for rain sponsored by the Sino-American Buddhist Association of Gold Mountain Temple, 1731 15th Street San Francisco, can testify to one thing: the people present were really working hard for rain. Arriving well before dawn, the Sino-American sponsors quickly unpacked their equipment, scoured the area of debris, and by sunrise had created a formal altar with a golden statue of their Original Teacher, Sakyamuni Buddha, and a picture of the spiritual being whose compassion was to be especially sought that day: the Bodhisattva Gwan Shr Yin. Offerings of flowers, fruit and incense framed the images, while Dharma instruments lay on the red velvet altar cloth waiting to be played. A brilliant gold banner, lettered with the invocation: NAMO GWAN SHR YIN PU SA, was stretched across the far end of the meadow, and the foreground was dotted with dragon-bearing posters (dragons make rain) pointing to where the SABA banner was suspended in the breeze, each poster with the announcement, DHARMA RAIN. The host-participants wore robes, some black, others subdued blue or grey, and sashes of earth tones. Those who had left the home life as monks and nuns had their heads freshly shaved, a symbol of renunciation. All had an air about them of joyous intensity and seriousness of purpose. They had already been reciting prayers and mantras for the entire week previous to the Gathering. To represent their sincerity, many of them, including those whose regular practice is to eat only one simple vegetarian meal a day, had decided not to eat at all that day, and perhaps not the next if it did not rain. One monk had been fasting to end the drought since the previous Tuesday, and had made the vow not to eat again until it rained. The weather forecast gave no hope of rain, for a minimum of two full weeks ahead, due to the high-pressure zone off the coast, which was blocking storm clouds unseasonably. The days prior to the Gathering, temperatures reached a high of 75-76 degrees with bright sunshine—drought weather in the middle of winter, the culmination of two years of scarcity of rain. As the day of prayer and chanting opened officially at seven A.M., approximately one third of those present piled into The Great Vehicle, the Sino-American Buddhist Association's converted city bus, and headed for the Bandshell to begin the procession back to Marx Meadow, chanting NAMO GWAN SHR YIN PU SA. NAMO means "homage," and PU SA is short for "Bodhisattva," that is, a being who is enlightened and who enlightens other beings. GWAN SHR YIN, whose Sanskrit name is Avalokitesvara, is the Bodhisattva who embodies infinite compassion, in much the same way as does the Virgin Mary in the West. But whereas the Virgin Mary is known as the Mother of Jesus, Buddhists feel the Bodhisattva Gwan Shr Yin is the compassionate Mother of every single person. As one of the nuns from Gold Mountain said in her talk that day, "You might forget her name; but if you ever saw her, you'd never forget her thousand arms and all those heads." The multitude of hands and eyes and arms represents the ability of the Bodhisattva to rescue all living beings at once, under any circumstances, anywhere. Buddhists teach that Gwan Shr Yin Bodhisattva universally responds to invocations, and that anyone who is sincere will obtain a response, rescue from difficulties and relief from pain. NAMO GWAN SHR YIN PU SA, then, was what they chanted as they walked from the Bandshell to Marx Meadow, their strides slow and solemn, and most of them bareheaded on that unexpectedly cold and foggy morning. The procession took one hour to reach the Meadow, where the monks, nuns and lay people were reciting a mantra before the altar. Their number had been augmented by members of the general public, who may or may not have believed in Buddhism, but who were united in their wish for rain. As the crowd repeated the chant, the fog began to swirl, as the wind picked up and blew through the meadow. The ceremonies continued: recitation once again of NAMO GWAN SHR YIN PU SA while circumambulating the altar, then sitting, more recitation, followed by the formal meal-offering for lunch. Those who were fasting continued to recite mantras and, when rejoined by those who had eaten, began another procession, this time from Marx Meadow to the Bandshell. Recitation of the mantra there gave way to informal talks and lively songs, as the monks and nuns of Gold Mountain, no longer solemn and intense, explained to their fellow San Franciscans just why it was that they were having a drought. "We've been too selfish and greedy, and we've wasted water," they said, "But if we can admit our mistakes and change for the better, the sincerity of our repentance and reform can evoke a response. If we don't change for the better, however, we are sure to experience far worse troubles. Due to everyone's becoming greedier every day, and having more and more hatred and being more and more stupid, our very lives are in danger each moment, for we have reached the point where our weapons could destroy all life on this planet. That is the real danger which we face right now, beside which a water shortage or even a famine, scarcity of energy or a lack of consumer goods is insignificant." Their message was, as Buddhism teaches, that individuals are responsible for the situations in which they find themselves, and so are people as a group; that there is retribution in kind for everything one does or omits to do. "Plant good causes and you will reap good results' plant bad causes and you will reap bad results," they told the crowd, which meant that each one of us is responsible for whether we have timely rain or not. Seeking rain, participants in the Dharma Gathering for Rain, held in Marx Meadow, Golden Gate Park, San Francisco, February 19, 1977, bow before the Buddha altar with sincerity and concentration. After talks in the Bandshell, a great many people joined the procession chanting Gwan Yin's name back to Marx Meadow, as reporters took pictures and films for television. Once again before the altar, all the participants joined in the sincere and intense chanting, now kneeling on the bare, damp ground, now bowing in full prostrations to the ground, now circumambulating the altar as they recited. Later in the afternoon as the mantra was recited, actual rain clouds began to form, and some people saw golden dragons in the sky and in the trees. At one point, before the Dharma Gathering was to end at six P.M., the rain clouds, which had formed, moved in from the West and covered the city. Clearly it would only be a short time before it rained. As the crowd dispersed with nightfall, the Buddhists from Gold Mountain, after twelve solid hours of concentrated effort seeking rain, returned to their Temple for the daily seven P.M. Sutra lecture and evening worship. After that, did it rain? At the City of Ten Thousand Buddhas, the Sino-American Buddhist Association's new center in the Ukiah Valley, one hundred and ten miles north of San Francisco, it began to rain early Sunday morning. It was around 11:30 A.M. that Sunday when the massing rain clouds one could see over the city pelted San Francisco with rain. People started calling Gold Mountain to ask how long it would continue to rain. It was still raining Monday when Susan Hewitt, reporter for Eyewitness News, KPIX channel five, who had covered the Gathering on Saturday, returned to Marx Meadow for an on-the-spot report. Right there had stood the altar, she pointed out, where the Buddhists had prayed for rain. Now it was raining, just as they had sought, and where the altar had stood was a huge puddle of water. That confirmed it for the city and when people saw the monks and nuns of Gold Mountain on the streets, often they would thank them for the rain. But, as was then pointed out, anyone can evoke such a response by sincere and unselfish self-examination, repentance and reform, and invocation. The power of repentance and prayer is not the sole preserve of one particular religious group. As long as people embody the compassion of Gwan Shr Yin Bodhisattva, do not fight with each other, and do not waste water, there is every hope for timely rain.